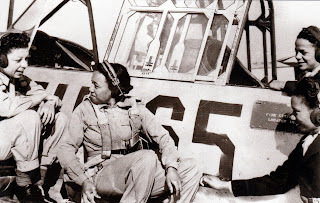 The Tuskegee Airmen were the first African-American military pilots in American history. 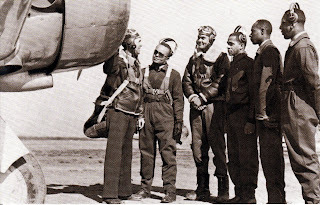 In 1942 the Army Air force opened a training post for pilots and technicians at the Tuskegee Institute in Tuskegee, Alabama. Army nurses c. 1943 learn cockpit procedures at Tuskegee Army Air Field in Tuskegee, Alabama. The Tuskegee Airmen were honored at last night's Sixers-Knicks game at Madison Square Garden. 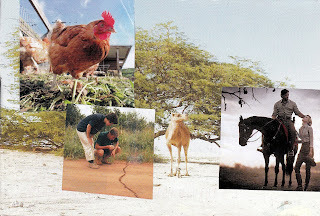 That reminded me of these postcards, part of a series I picked up while visiting the Tuskegee Institute five years ago. 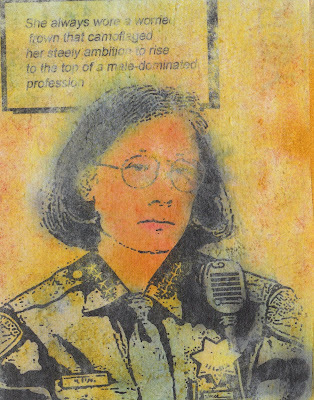 Mrpotani made this postcard image of Heather Fong, the chief of police in San Francisco. She is retiring in April after serving for five years. I made this postcard for someone who said she liked butterflies, but I may have become a tad carried away. Mrs. October, my venerable baseball pal, collaged the back of this postcard which arrived on Wednesday, the day of the Phillies' first spring training game. A sweet message! The front was a picture of the Phanatic, from 1988. Susanna, a Finnish postcrosser studying in Germany, made this super altered card, using an Atget photo of children watching a Punch and Judy show. The German postal system got in the act by cancelling the front of the card instead of the stamps on the back. Jazz! 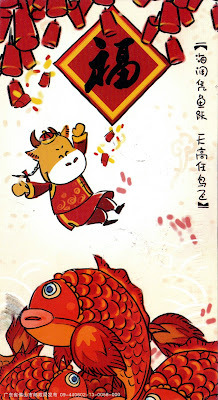 A delayed New Year's card--worth the wait--from a postcrosser in China. 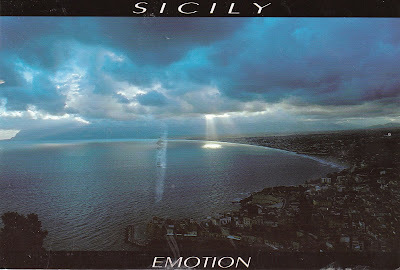 Sicilian drama courtesy of an Italian postcrosser. 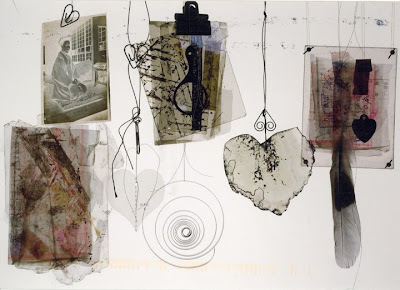 Here's a Mailart Call from France, in French and in English. The subject is "Public garden/private garden." Nous lançons à cette occasion un appel à participation sur le thème Jardin(s). A l'occasion de la manifestation "Jardins publiques / Jardins privés" les 26, 27 et 28 juin, la médiathèque se joint à l'association artistique "Aldébaran" et organise une exposition temporaire d'art postal, regroupant une sélection des oeuvres reçues. 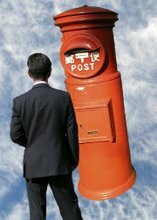 Laissez libre cours à votre imagination, osez l’originalité, l’humour et la poésie, afin de créer un œuvre postale insolite et originale autour du thème proposé. Organisé pour tous, cet appel vous est donc ouvert, que vous soyez jeune/moins jeune, expérimenté/amateur, seul/en groupe… C’est la diversité des œuvres qui fera la richesse de l’exposition. Une seule contrainte : l’œuvre doit être visible par le facteur. Rubrique ’’Action culturelle et pédagogique’’. La manifestation "Jardins publiques / Jardins privés"
Aldébaran propose depuis 6 ans un projet estival entièrement conçu en extérieur dont le concept offre sur la commune de Castries la rencontre de différents domaines artistiques. Aux heures ou la chaleur se fait plus douce, les portes d'une douzaine de jardins privés et celles des jardins du château de Castries s’entrouvrent afin de soumettre aux regards les œuvres créées pour cet événement répondant à la problématique de la création in situ et créées pour ces lieux intimes et exceptionnellement ouvert au public. 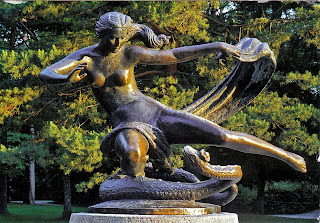 The Castrian art association « Aldébaran » oganizes each year since 2003 an annual art exhibition that takes place in either private or public gardens or parks. La manifestation "Jardins Publics / Jardins Privés" créée en 2003 sur Castries a permis d'expérimenter un concept au sein duquel les villageois participent activement et s'engagent en prêtant leur jardin à l'élaboration et à la concrétisation d'un projet artistique se déclinant sous la forme d'une balade artistique dans le vieux village. Se démarquant des propositions culturelles urbaines cette promenade estivale, où le public prend le temps de jeter un regard différent sur ce qui l'entoure compte à présent comme le moment fort de notre programmation rencontrant un succès grandissant d'année en année. The Françoise Giroud Library of Castries (France) organizes from December 8th 2009 to January 9th 2010 a Mail art exhibition. We therefore send out a call for contributions on the following subject : Garden(s). 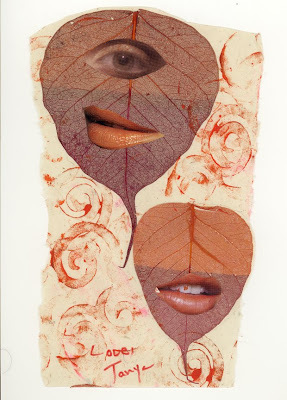 A special temporary exhibition will be set up during the "Jardins publiques / Jardins privés" event that takes place from june 26th to june 28th 2009, showing a selection of what we have already recieved. http://www.montpellier-agglo.com/mediatheques,in the "Action culturelle et pédagogique / Art postal" section. 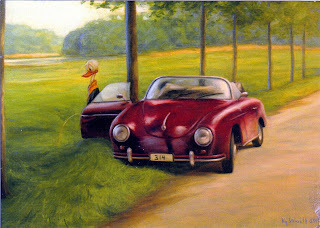 The Castrian art association « Aldébaran » oganizes each year since 2003 an annual art exhibition that takes place in either private or public gardens or parks. Visitors are invited to an artistical stroll through the village, presenting pieces by major contemporary artists. More details on the following website. 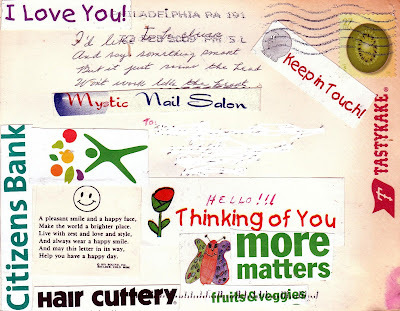 A German postcrosser kept the altered postcards coming. 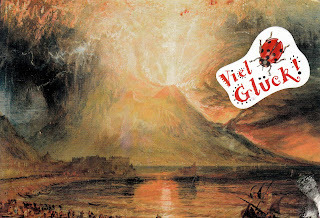 This one shows a painting of an erupting volcano---with wishes for 'good luck'. 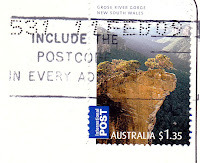 I was delighted to get this altered postcard from an Australian postcrosser with a sense of humor. He sent along an amusing quotation about the tyranny of telephone calls. The card itself is from Bahrain. 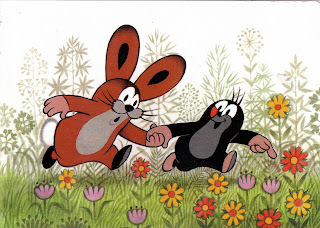 This goofy harbinger of spring is courtesy of a Finnish postcrosser. 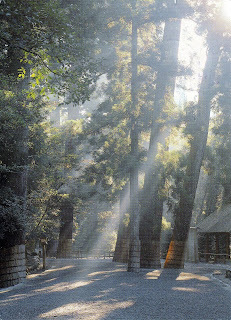 A Japanese postcrosser sent this view of Ise jingu with the Hello Kitty stamp above. Who knew this kitty would become an international icon? 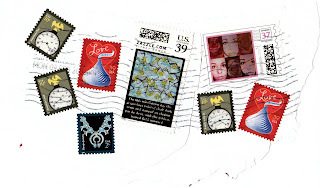 The stamps at bottom were on the postcard below, while the striking moth stamp in the middle is from Finland. The homage to eating together, at top, is from Taiwan. I know my favorite. What's yours? 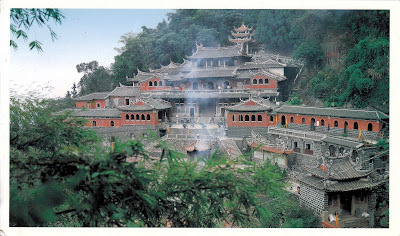 I can almost smell the incense burning at Qing Shui Yan, a famous temple in Anxi, China. The card came from a Chinese postcrosser who wrote about a yearly pilgrimage to the temple. Weinstein Gallery in Minneapolis will hold Art & Object, a multimedia exhibition: Africa, Asia and the Americas from February 21 to April 25. 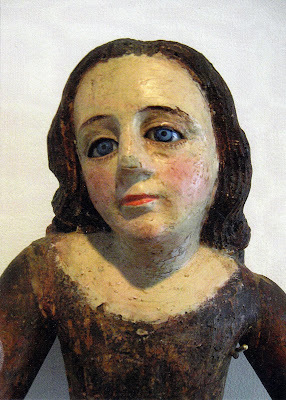 The card for the exhibition shows an 18th-century colonial figure from Ecuador. The sad-faced look of resignation is haunting. 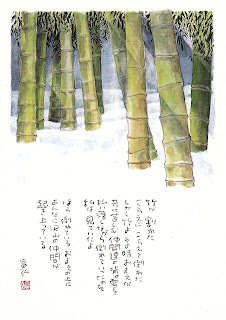 My post office pal in Tono sent this lovely postcard of a bamboo grove in the snow with these stamps commemorating the 100th anniversary of Japan's Astronomical Society. 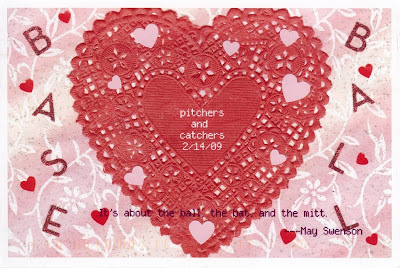 All of the day's hearts and flowers coincide with Philadelphia pitchers and catchers reporting to the Clearwater complex in Florida. Happy, happy! 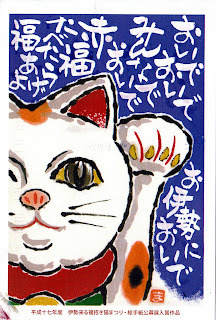 I used a paper doily, wrapping paper from a Tokyo friend, and assorted stickers to make this postcard. The quotation is from May Swenson's great poem The Analysis of Baseball. If you don't know it, check it out. 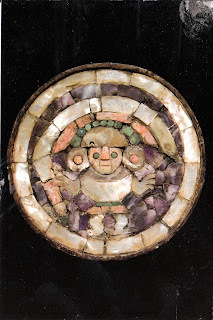 I love the makizushi look of this Peruvian ear spool, circa 1400. 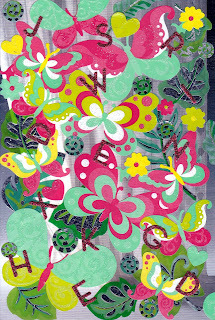 The card is from friend Lynn B.
I put out a call for altered cards and a Dutch postcrosser was the first to response with this funny, funny card. Many thanks! 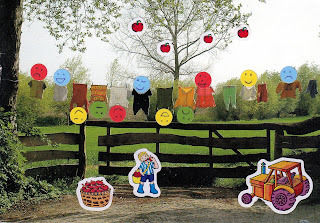 I love it all, especially the faces on the heads she added to the laundry. 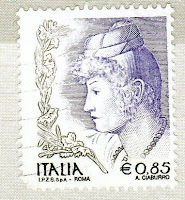 Some stamps from mrpotani, including a couple she designed herself. Egle, wrote the Lithuanian postcrosser who sent this postcard, is a character from a Lithuanian fairy tale. The name means spruce. It's a lovely statue and makes me think the world needs more statues of naked men. 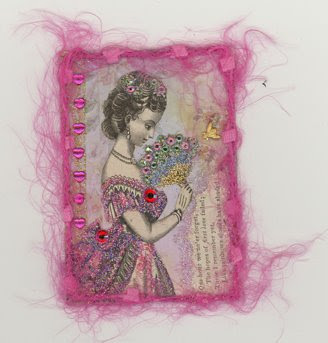 My artist group did a mini-workshop on collaged ATC's (artist's trading cards). I was so inspired I went home and made two batches using my large stash of papers. 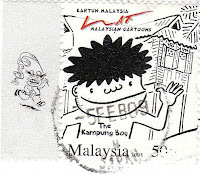 Thanks to a Malaysian postcrosser for this zany cartoon stamp. 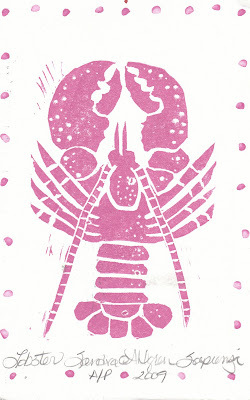 On her previous postcard Sandy wrote that she was working on a lobster stamp and here it is. Very cool! 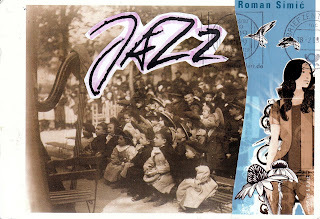 I picked this postcard up last week at Settepani, a great cafe/bakery on 120th and Lenox in Harlem. 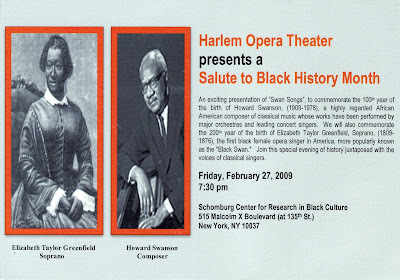 Soprano Elizabeth Taylor Greenfield (1809-1876) was America's first black female opera singer. She was dubbed the "Black Swan". Howard Swanson (1909-1978) was a classical composer. 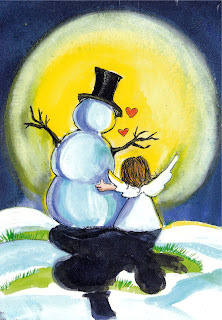 A Finnish postcrosser sent this sweet Valentine's Day greeting and Christmas stamp. This handsome fellow and curious peacock stamp are from a Finnish postcrosser. 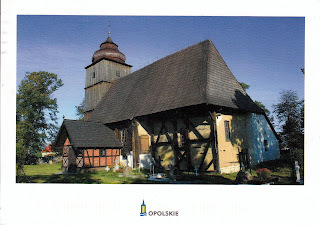 A Polish postcrosser sent this postcard showing an old wooden church from a village in her region. The church is now in an open-air museum in Opole. 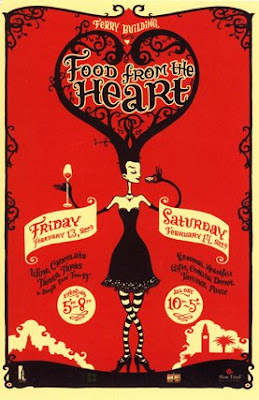 Mrpotani designed this postcard for this upcoming exhibition. She is also in the show. 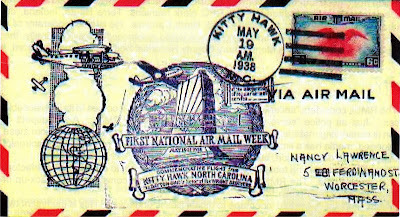 This cachet, from the collection of Jeffrey Shapiro, was issued in 1938 to commemorate the first National Air Mail Week, an effort by the postal system to encourage its users to send airmail letters. 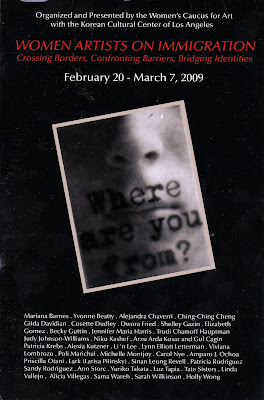 Site-specific cachets were issued all around the country. To learn more about this and other cachets, visit www.lingens.com/articles/shapiro/namw.shtml. A photocopy of this cachet was among the information that came in the mail from Frank R. Scheer, head of the Railway Mail Service Library, which is dedicated to the history of postal distribution. Housed in a 1913 train station in Boyce, Virginia, the Library has an extensive collection of original materials and artifacts pertaining to the transportation and distribution of mail in the US and abroad. It sounds fascinating! Mr. Scheer included an invitation to drive down I-81 to visit the library and I hope to take him up on it. 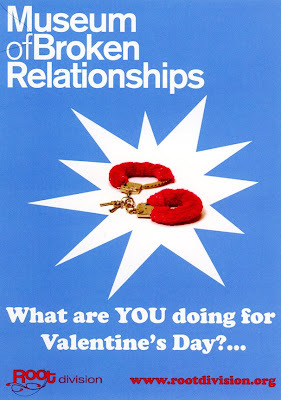 For more information: www.railwaymailservicelibrary.org. The site is a bit "clunky" but bear with it and you will find much of interest. 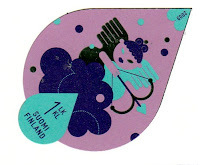 Finnish postcrosser Jenni sent this amusing Kaj Stenvall postcard, called Freely Breathing, and cute Cupid stamp. 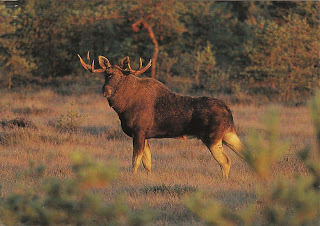 I'm starting to think that the Finnish postal system is a party. It seems to take a fun, inventive approach.